Since 1990, Mona Golub has presented award-winning global concerts to adventurous and appreciative audiences on the Agnes S. Macdonald Music Haven stage in the heart of Central Park in Schenectady, NY. In their 29th season of free concerts, Music Haven has expanded their roster and embarked on a number of collaborative partnerships with organizations across the region. On July 19th, Caffe Lena will be bringing our good folk to the Music Haven Stage in downtown Schenectady with a top-notch bluegrass show featuring Mile Twelve and opener Honeysuckle. 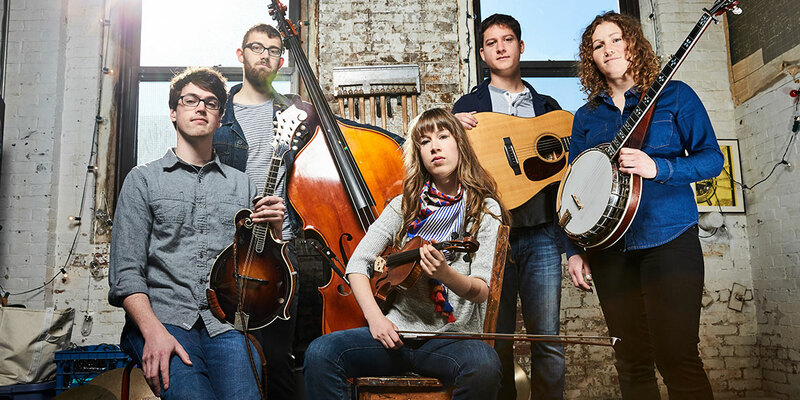 Contemporary bluegrass band Mile Twelve treads the line between the old and the new. Their captivating songs featuring complex, daring instrumental arrangements, stemming from a variety of musical influences. Lighting up the bluegrass festival circuit – including Grey Fox, Freshgrass, and Joe Val Festival – they have garnered recognition from many notable bluegrass musicians, including renowned banjo player Tony Trischka, who noted that Mile Twelve’s instrumental skills reflect natural abilities enhanced by serious study of bluegrass tradition and a fearless desire to create fresh pathways. Mile Twelve features guitarist Evan Murphy, who studied guitar with the director of the New York City Guitar Orchestra, New Zealand native and Auckland Folk Festival-winner Catherine (BB) Bowness on banjo, Nate Sabat, a Berklee graduate and trained choral singer on upright bass, fiddle-player Bronwyn Keith-Hynes, who has won several bluegrass fiddling contests and currently teaches at Berklee, and mandolinist David Benedict, a former student of Grammy-nominated mandolinist Matt Flinner alum of Nashville band Missy Raines & the New Hip. All five sing and write songs, creating a richly textured blend of different songwriting instincts, and gorgeous, varied harmonies. Mile Twelve first played at Caffe Lena this past winter as a part of our Bright New Music Series and blew away our sold out audience. Tonight they will have the chance to play their topnotch bluegrass music where it was meant to be played: outdoors on a summer evening. Honeysuckle is a progressive folk act that blends older influences and traditional instrumentation with modern effects and inspiration. Comprised of Holly McGarry, Benjamin Burns, and Chris Bloniarz, this Boston based band can frequently be found performing across the country, playing alongside bands like The Ballroom Thieves, The David Grisman Sextet, Boy & Bear, Sam Moss, The Western Den, The Novel Ideas, Shook Twins, John Craigie, Damn Tall Buildings and others.